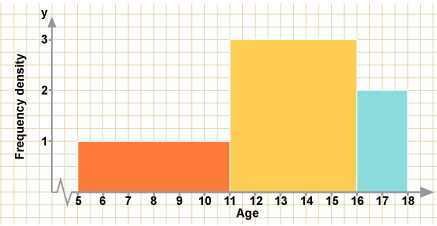 The histogram shows the number of children in each age group on a school bus. There are no children under 5 years and no children over 17 years. There are 6 children aged between 5 and 10 years . Explain why the class boundaries are 5, 11, 16 and 18. Complete the following table. How many children are there on the bus altogether? Remember that in a histogram, it is the area of the bar that represents the frequency. It would therefore be incorrect to label the vertical axis ‘frequency’ and the label should be ‘frequency density‘.